Learn SQL, Python, R, and other data science skills with interactive online courses designed for non-IT people. Uber drives you. We drive Uber. Over 5000 people at Uber took a ride in our online SQL courses. Why do the employees of the world's best-known data-driven company love Vertabelo Academy so much? Your courses do a great job of explaining the material and are very challenging but not discouraging. I have really enjoyed your courses, and I always recommend your company anytime I come across somebody looking to learn SQL. Lots of practice and encouragement as well as help if you need it. Just look at the class chat area. The stuff I have learned so far has helped me in several projects that I am currently working on. Vertabelo is really easy to use, the learning is well-paced, and the interactive platform is exceptional. The best part is, I can log on any time during work or at home and do a few lessons to advance my knowledge. Vertabelo is an amazing resource for learning SQL. The curriculum is well designed, the databases and exercises are varied and interesting, the layout is superb, and the staff is responsive and helpful. I can't wait to see what else is coming as new courses seem to be popping up regularly! Vertabelo Academy provided me with the chance to learn SQL well enough to list it as a skill for my resume and job applications. This has been a great supplement to my education. It is a great resource (and an inexpensive one) to learn SQL and get the language mastered. Take another step into the world of Python programming and sign up for our Python Basics Part 2 course today! Take your Python knowledge to a higher level with Python Basics Part 3 – the final course in our Python Basics series. Learn to use top Python data structures and write a real PC game. Refine your SQL skills with 88 interactive exercises, ranging from simple tasks with SELECT FROM statements to more advanced problems involving multiple subqueries. 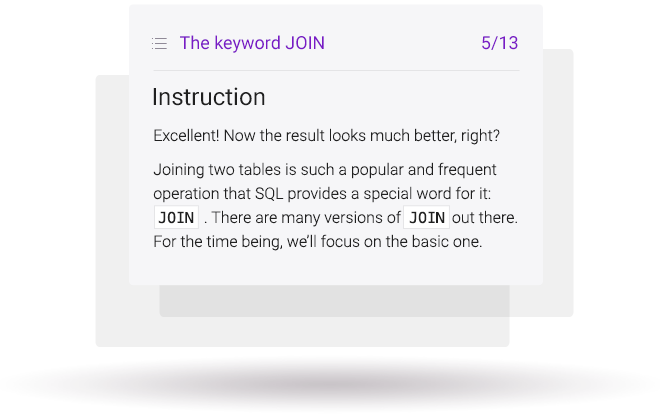 Review and deepen your knowledge of SQL JOINs with 93 exercises. Practice common and less common ways of getting data from multiple tables. Discover the hottest programming language, and learn how to mine through data faster and more effectively. No IT background needed. Explore the universe of tidyverse – the most useful set of packages in the contemporary R language. Learn the basic principles of good data visualization. Beginner-level course to help you understand key statistical metrics in data analysis. Discover SQL Server data manipulation language (DML) processes. Learn how to insert, update, and delete data from a database. 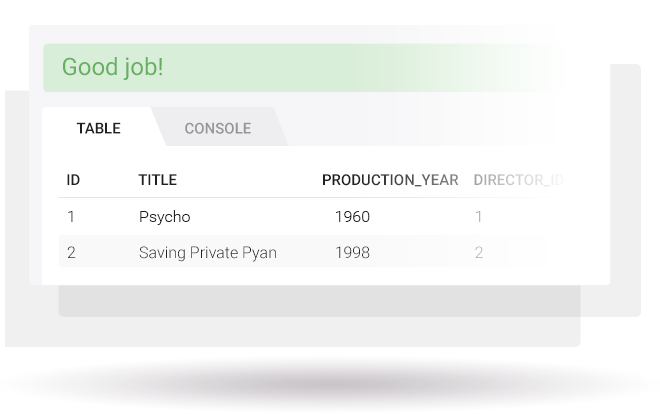 Learn how to use ROLLUP, CUBE, and GROUPING SETS—three extremely useful GROUP BY extensions that will help you create sophisticated queries in no time. Learn how to work with the Python CSV module, and automate simple work tasks! Find out how to open, read, write a CSV file in Python. Done with our introductory R course? Learn how to efficiently analyze data with lists and functions. Tak your career to next level! Still not sure which course to choose? Our hands-on approach uses real-life examples and hundreds of engaging, informative exercises. Study on your own schedule. No deadlines. No due dates. No time crunch. Prove your new skills by earning a certificate for your resume or LinkedIn profile. At Vertabelo Academy, we believe that learning by doing is the best way to master a new skill. That’s why our courses are fully interactive. Real-life examples and scenarios show how you can use the concepts and techniques presented. Start by reading the exercise's instructions and explanations in the Instruction box. Once you understand the concept, read the Exercise. 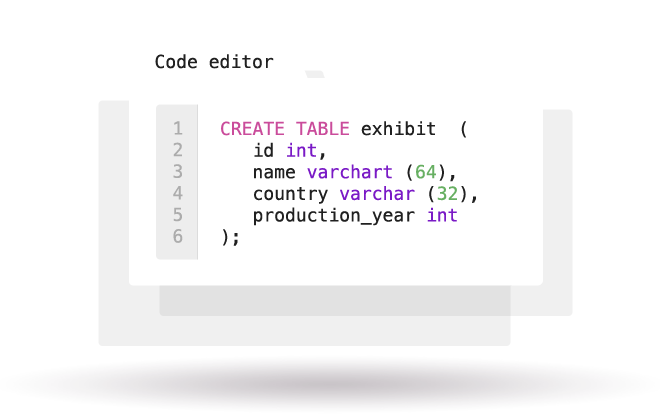 Type your code in the Code Editor and test it on a real database. Get instant feedback and move on to the next challenge. Solve examples and exercises modeled on real-world problems. Get comfortable working in a realistic database environment. Challenge yourself! See how far you’ve come and how you compare with other learners.